Magnolia tripetala L. x Magnolia virginiana L. hybrid. A fully hardy, large, wide-spreading shrub with leaves to 25cm long, persisting into early winter, and large, fragrant, creamy-white flowers intermittently throughout summer. [RHSD, Hilliers', Hortus]. 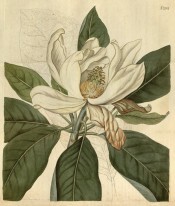 ‘The present variety of this charming tree, with delightfully fragrant flowers, was raised from seeds of Magnolia glauca, saved in 1808, by Mr. Thomson, in his Nursery at Mile End; who informs us, that it is quite hardy, not being affected by our severest winters; and grows freely in a mixture of bog-earth and loam. It flowers abundantly in June and July, perfuming the air for a considerable distance. […] It has been a question among cultivators, how far exotic trees of warmer regions may be naturalized to our climate by propagating them from seeds ripened here. It has even been supposed that, by a repetition of this process, the tenderest plants may in time become hardy. On the other hand it has been asserted, that such plants, when raised from seeds produced here, have less vigour, and are less able to bear the severity of our climate, than imported plants, or those raised from imported seeds. The present case, as far as one experiment can go, favours the first opinion; but then it is to be remembered that Pensylvania, the native country of Magnolia glauca, is subject to much severer cold than Great Britain; and the reason that the young shoots of North American trees are frequently killed by our frosts appears to be, that our summers are not sufficiently warm to harden the wood. But if plants raised from seeds ripened here can bring their wood to sufficient maturity, in the moderate heat of our summers, to resist the winter frosts, which those raised from foreign seeds cannot, the advantage gained amounts to the same. Mr. Thomson observes that the young shoots of his new variety are never injured by our frosts; which, with the freer growth and greater vigour of the plants, seem to show an acquired habitude of climate.’ [BM t.2164/1820]. When the above was published the hybrid nature of this plant was not recognised. Listed in the 1850 and 1857 catalogues [T.664/1850]. Desideratum to Loddiges’ Nursery, 6th January 1845 [MP A2933-2, p.28]. This is the probable source. This now very rare tree has recently been reintroduced to the gardens.